Earlier in the day, Israeli forces unleashed a series of strikes on more than 40 Hamas military targets in the Gaza Strip. 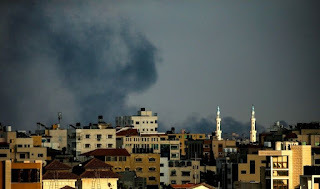 "Israel's military said its aircraft and tanks targeted 40 Hamas posts and that the strikes formed part of a ‘wide-scale attack’ in response to the border shooting," IDF’s Jonathan Conricus tweeted. The Israeli Defense Forces also said their jets and tanks pounded the militant group's infrastructure, attacking almost 70 targets throughout the enclave.